An Air Force B-52 Stratofortress executes a show-of-force at the San Gregorio Training Area in Zaragoza, Spain, Nov. 4, 2015, during Trident Juncture 2015 — the largest NATO exercise to be conducted in the past 20 years. 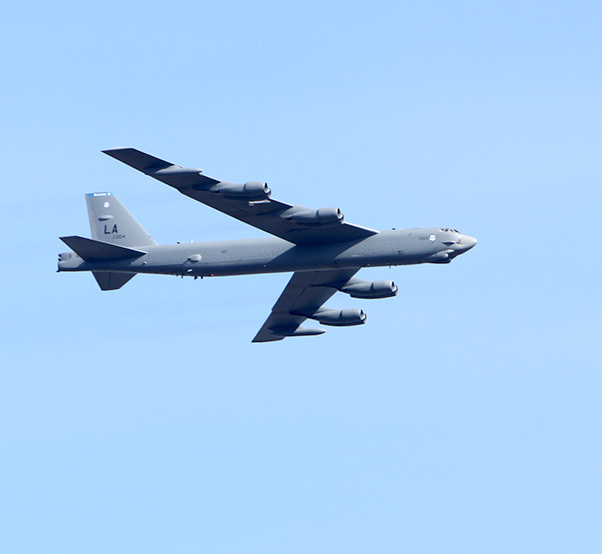 During the nonstop sortie, which lasted approximately 26 hours, two B-52 aircrews from the 2nd Bomb Wing flew from Barksdale Air Force Base, La., to the multinational exercise area of operations. Two B-52 Stratofortress aircrews assigned to Air Force Global Strike Command conducted a long-range bomber mission to the U.S. European Command area of operations Nov. 3-4 as part of Trident Juncture 2015 — the largest NATO exercise in the past 20 years. 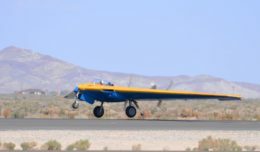 During the nonstop sortie, which lasted approximately 26 hours, the B-52 aircrews from the 2nd Bomb Wing flew from Barksdale Air Force Base, La., to the multinational exercise area of operations, where they executed a show-of-force in Spain, participated in a naval maritime strike scenario, and conducted a large force integration scenario in Portugal. With about 36,000 participants from more than 30 allied and partner nations, Trident Juncture uses a fictional training scenario to assess NATO’s agility and ability to meet operational challenges while responding to global threats to peace and security. Participation of a strategic bomber in Trident Juncture highlights the United States’ commitment to NATO allies and partners and enhancement of regional security. This most recent B-52 mission follows a series of similar partnership activities in the EUCOM area. In September, a 2nd Bomb Wing B-52 aircrew flew from Barksdale AFB to Postojna, Slovenia, where they worked with Slovenian and U.S. joint terminal attack controllers at a range near the Slovenian town of Pivka to provide close air support to allied forces during Exercise Immediate Response. TSgt. 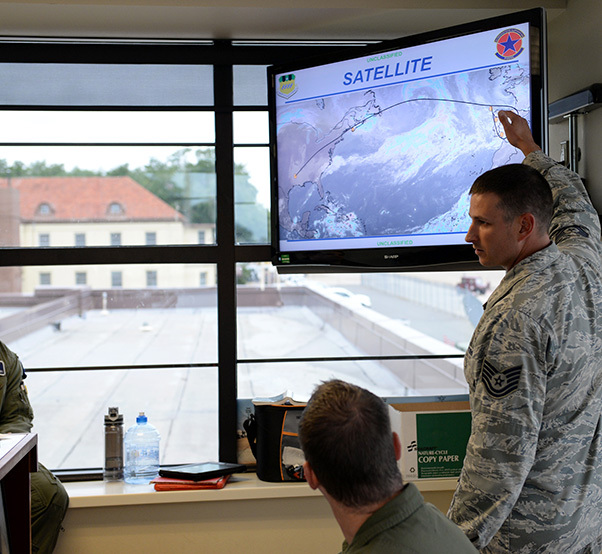 Christopher Watts, a 2nd Operations Support Squadron weather technician, briefs aircrews at Barksdale Air Force Base, La., Nov. 3, 2015, before a long-range bomber mission to the U.S. European Command area of operations in support of Trident Juncture 2015 — the largest NATO exercise conducted in the past 20 years. During the nonstop sortie, which lasted approximately 26 hours, two B-52 aircrews flew from Barksdale AFB to the exercise area of operations where they executed a show-of-force in Spain, participated in a naval maritime strike scenario, and conducted a large force integration scenario in Portugal. In June, three Stratofortresses from Minot AFB, North Dakota, deployed to Royal Air Force Fairford, England, where the bombers trained and integrated with U.S. and allied military forces in the region during exercises Baltops and Saber Strike. 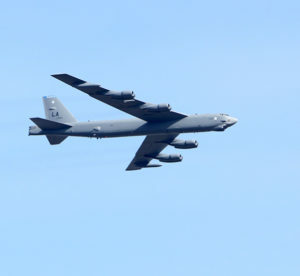 The deployment followed an April nonstop round-trip sortie by two Barksdale B-52s from their home station to the North Sea, where aircrews participated in dissimilar air intercept maneuvers with fighters from the Royal Canadian Air Force, the United Kingdom’s Royal Air Force and the Royal Netherlands Air Force. 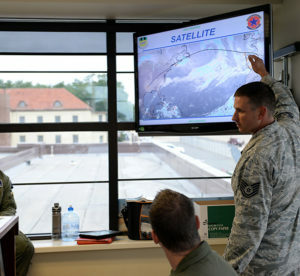 Maj. Gen. Richard Clark, the 8th Air Force commander and U.S. Strategic Command’s Joint Functional Component Command commander for AFGSC, said the participation of B-52 forces in Trident Juncture demonstrates the ability of America’s long-range strike force to quickly support multinational forces anywhere on the globe. The B-52 Stratofortress is a long-range, multirole bomber that can perform a variety of missions. Through the use of aerial refueling, the range of a B-52 is limited only by crew endurance. It has an unrefueled combat range in excess of 8,800 miles.